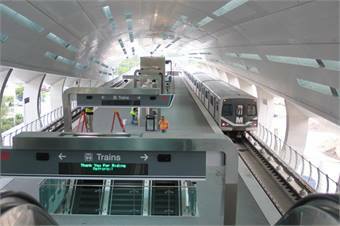 Miami-Dade Transit (MDT) opened its 23rd Metrorail station – the new Miami International Airport (MIA) Station. Metrorail’s new Orange Line service, which will take passengers to the new MIA Station, began providing regular service to MIA in late July. The new MIA Station is the centerpiece of the People’s Transportation Plan (PTP). In 2002, Miami-Dade County voters approved a half-penny sales surtax, overseen by the Citizens’ Independent Transportation Trust (CITT), to fund the People’s Transportation Plan. The PTP is a comprehensive program of both roadway and transit improvements. Construction of Metrorail’s extension and station were funded with $404.7 million from the PTP surtax, and $101.3 million from the Florida Department of Transportation (FDOT).